You’re going to need tissues! Ever wonder what your dog was thinking? You’ll find out in Universal, Amblin Entertainment, and Walden Media’s glorified Hallmark movie that follows the soul of a loving dog. As such, A Dog’s Purpose is one of those films that is so simple yet emotionally touching. Based on the novel written by W. Bruce Cameron, this movie will tug at even the toughest of hearts. Although the film does not follow a traditional diegetic arc, three-act structure, and is filled with constant verbal exposition in the form of a voiceover, it is still enjoyable and works as a great date movie. No critical thinking required. Still, the author’s tagline “a novel for humans” can be seen in the social commentary on primarily human relationship dynamics followed by the relationship between a pet and his or her owner. Filled with moments of laughter and tears, A Dog’s Purpose is a film that everyone who either has or has ever had a dog should see. If you’re a cat person like me, then there isn’t much here for you–sorry. However, I was moved to tears during a scene in which the focus was on a human romantic relationship getting rekindled. You will never look at your dog the same way again and will likely go home and hug him or her just as a friend of mine did after she screened the film with me. 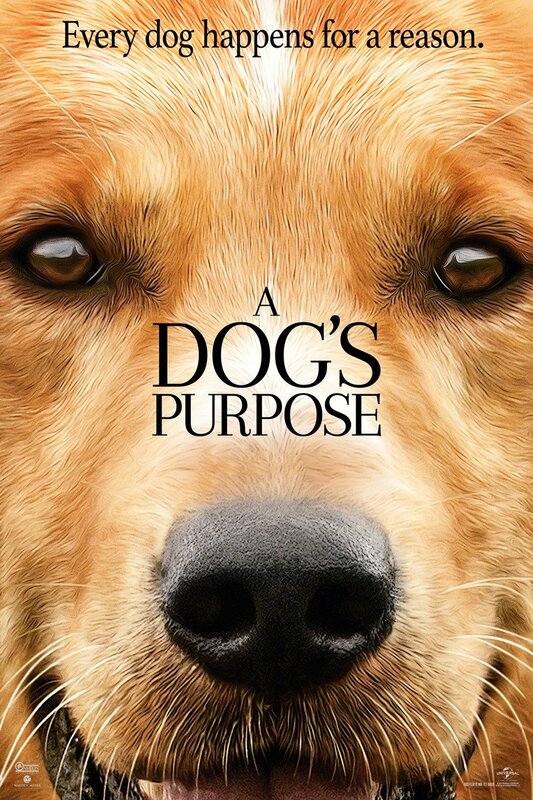 A Dog’s Purpose is about a dog who discovers the purpose for his existence as he is reincarnated into different dogs over the course of his life. Finding himself part of different families–or as he likes to refer to them–as packs, Bailey does his best to affect humans by influencing their respective needs to laugh and love. Despite the rather two dimensional nature of A Dog’s Purpose, there is a deeper theme within the mostly shallow story if you examine the film closely enough. Not shallow in that there lacks emotional appeal or enjoyment, but shallow in that there is very little that is complex and dynamic in the narrative. Although Bailey spends most of his on screen life with Ethan (K.J. Apa), Bailey’s soul finds itself in other dogs who are part of their own respective family. Doing a close reading of the film reveals that each family unit represents a different kind of relationship dynamic or lack thereof. I won’t spoil it by describing each type of relationship, but knowing that there is social commentary on human and pet relationships could likely increase the appeal and enjoyment of the film for those who prefer movies with a more cerebral plot. Interestingly, the movie includes families/human relationships that represent a good cross-section of the types of relationship dynamics that exist in our lives. For those who typically enjoy Hallmark movies, then you’ll definitely enjoy this one. Last January we had glorified Lifetime movies and this year it must be Hallmark’s turn. As I have not read the novel, I cannot comment on differences between the book and the film adaptation.